Music helped change his life. Now Pierre Dufresne knows how to listen more closely than most. “Music has charms to soothe the savage breast,” English poet and playwright William Congreve famously penned in 1697. But there’s about as much savage in Dufresne as Mahatma Gandhi. 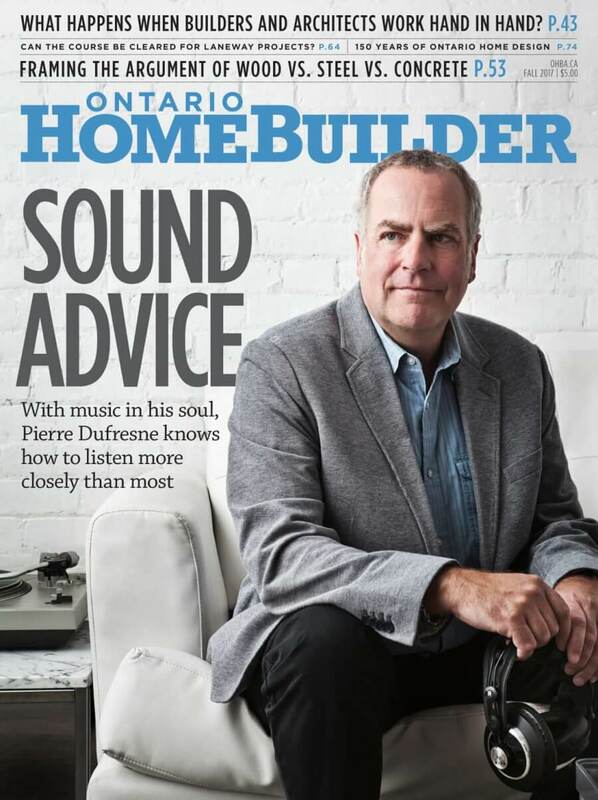 For the Ontario Home Builders Association’s incoming president, consider it a therapeutic regimen. “Some lyrics do capture me, but it’s more the music than the words,” notes the vice-president of Land Development at Tartan Land Corporation in Ottawa, who, apropos, texts that message on Friday, August 11 from the 2017 Peach Music Festival, a four-day event featuring dozens of alternative rock, jazz, blues groups at Montage Mountain in Scranton, Pennsylvania. Some people go to the cottage or the Caribbean. Pierre Dufresne goes to jam band festivals. What’s a jam band, you ask? “The best definition I’ve ever heard was a reference to the actual listeners at those events—how much fun they’re having and how many friends they’re making,” Dufresne explains. As with many, we need only peer through Dufresne’s Facebook page to learn what else fuels his inner flame. There we discover that on May 31 he updated his profile picture, with a debonair Dufresne staring point blank back at the camera, sporting a pair of black sunglasses that look they were borrowed from Tom Cruise. In the background is a café in downtown Gothenburg, Sweden—which explains the lapel pin of crossed Canadian and Swedish flags on his grey blazer, a souvenir of this year’s OHBA International Housing Tour. His previous post shows an on-stage photo of Gregg Allman at the keyboard, the recently departed member of the Allman Brothers Band. The post before that is an old black and white shot from the long-gone Montreal pub, Taverne du Coin. Preceding that you can find a string of photos of CFL games (including his beloved Ottawa Redblacks) and assorted Montreal Canadiens and Expos references. The love affair with Les Canadiens developed organically. Dufresne was born in Ottawa on Feb. 12, 1964, but raised in the Notre-Dame-de-Grâce (NDG) neighbourhood of west Montreal to a unilingual Irish mother and Francophone father, the latter of whom—currently a sprightly 92—worked in both languages as a journalist, primarily covering politics with the Canadian Press and newspapers such as the Globe & Mail, La Presse and Le Devoir. Aside from family, Dufresne’s undying love of the Habs may only be exceeded by his aforementioned passion for music. But that was a passion borne of trauma. For a guy who claims he can’t sing, though, Dufresne is blessed with the ability to unite disparate voices with the aplomb of a choirmaster. Jack Stirling, president of the Stirling Group, an Ottawa-based consulting and development firm, has seen Dufresne in action when Stirling served in the planning and development industry of both the public and private sectors with Genstar, Minto and the municipalities of Nepean and Ottawa, among others. “He’s also an amazing father and he was always very generous as an older brother,” adds Anne. “If Pierre had anything left over from his summer jobs as a youth, he’d share his earnings in whatever way they needed to be used at home. It’s general qualities like that which stand out for people—his good-naturedness, generosity, humility, gratitude. He’s the guy who will bring a stranger in for Christmas dinner. He likes to include people around the dinner table, and there will always be leftovers—usually his Newfoundland/Labrador Salt Cod soup! Tartan Land Corporation can attest to that. Dufresne joined the Ottawa-based developer straight out of university and hasn’t left in 26 years. Dufresne had secured a B.A. in Geography and Political Science at Carleton University, along with a Masters in Public Administration and Public Policy from Concordia. But he could well have earned a Masters degree in job interviews. “The president of Tartan Land Corporation, Doug Lazier, told me afterward that it was how I answered the questions that got me in front of the other candidates—showing flexibility instead of being too opinionated,” says Dufresne. “During the second interview, Wes Nicol, who was the founder and owner of Tartan Homes (and who passed away last November), came into the interview and fired off what seemed like about 20 questions. I remember thinking, ‘He is trying to f*&% with me now.’ But I thought about every question sequentially and how I would answer it, and I opened my mouth and answered the first question. Then I said, ‘To go on to your second question…’ And then Wes got up and said, ‘I’ve heard everything I need to hear,’ and left. An even temperament has always served as Dufresne’s conductor’s baton during those negotiations. “He’s a hard guy to fluster—he rarely loses his temper. Actually, I can’t think of him ever losing his temper,” says Stirling. “I don’t think we’ve ever argued (since he was a teenager),” notes sister Anne. Like a swimming duck, however, there’s sometimes a lot happening beneath the surface that belies a calm exterior. “I probably feel more emotionally volatile internally than I express on the surface, because I do realize that those emotions have to be overcome in order to provide the proper message and to get to the end goal,” Dufresne concedes. “That’s what’s so cool—and frustrating—about planning: Everybody knows what we’re supposed to be doing. We’re building housing, which is probably the most important consumer amenity next to food. It’s security, protection, financial stability and success and your retirement plan. The government wants everyone properly housed and implements policies to that effect. And then we have the municipalities saying, ‘OK, we’re going to tell you where to put housing.’ It can be so challenging to get to that place that everyone wants us to go. I can spend years on approvals processes just to get a plan registered and a single house built—and it’s the same house that everyone thought I was going to build there at the beginning of the whole process! Lord knows it’s not for a lack of preparation. In an industry that preaches, “Measure twice, cut once,” Dufresne might be as prepared as they come, suggest his industry associates. “He listens and he studies, so that when he walks into a situation he’s not firing blind and knows exactly what he’s talking about,” says Stirling. Dufresne will need to harness all that expertise moving forward. “It’s no secret that the home building industry is subject to many policy initiatives that were enacted by government,” he says. “I think they’re trying to create change for the consumer—the voter—and become more responsive to their needs. But by doing so, a lot of the policy initiatives, I believe, have not been properly assessed in terms of data. In some cases they’re actually going to be counterproductive to what we’re all trying to commonly achieve. “An example is rent control legislation,” Dufrense explains. “As soon as it was even whispered, I had several builders from Ottawa call me saying, ‘We already have projects on the books!’ Our condo market is flat, and some of our builder members are looking to convert condo projects into purpose-built rentals. There’s going to be quite a few projects that could come on stream in the next couple of years that may be in jeopardy because of the legislation. So what will that do? It will limit the eventual supply of rental units, which puts pressure on price. So when they do become available, they’ll be high demand and cost more, resulting in some people being shut out. I understand the attempt was to protect the consumer—those young professionals in Toronto losing their apartments and moving into their parents’ basements—but I don’t think this is the answer to the overall problem. Dufresne also knows that in his predecessor he has a good song sheet to read from. “Neil has been a phenomenal leader and a real mentor to me in walking into this position. He has incredible passion for the industry. He has put so much effort into all the activities he’s done over the past year,” says Dufresne, who intends to take advantage of his presidential opportunity. For those in the home building industry, that should be music to their ears.